One of the primary tenants of Bauhaus design is the unity of the arts, and the marriage between function and form. As a student of Walter Gropius, founder of the Bauhaus school, Max Bill had an intuitive understanding of this concept, and became a world-renowned designer and one of the most influential artists of our time. The Max Bill automatic date black dial offers clean and simple lines for a design that remains beautiful, but includes a date window at the 3 position for added functionality in day-to-day wear. 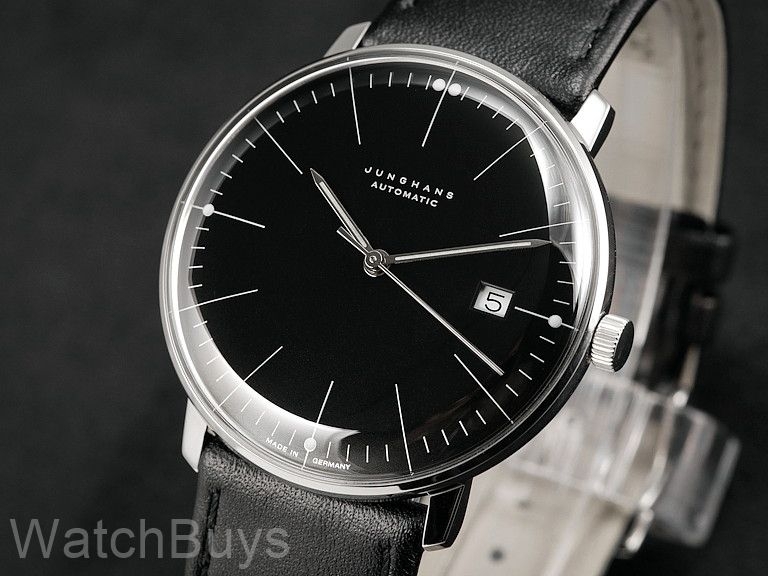 The watch features the Junghans J800.1 automatic movement, which is based upon the ETA 2824 and includes Incabloc shock protection. The slim-profile 38 mm stainless steel case features a polished finish for everyday versatility, and as an added bonus the solid steel case back includes the engraved signature of Max Bill himself. The dial is an inky black color and is slightly domed, providing additional depth for the elegantly thin and curved hands. The hands and appliques also feature SuperLuminova for easy viewing in low-light situations. A highly domed plexiglass crystal provides a vintage look while also offering the benefits of modern technology. The domed nature of the crystal refracts light in the same manner as vintage acrylic crystals for a unique illuminating effect. The SICRALAN® MRL UV coating method was developed for suppliers to the automotive industry. This transparent coating causes a functional and aesthetic value: increased scratch resistance, improved UV and chemical resistance and a more intense deep gloss of the plexiglass. The watch is equipped with a black calf skin strap with black stitching and features a stainless steel tang buckle.